The second chapter of my Xenoblade novelisation. Meet Shulk, our main character! The sound of clunking metal filled the air of the Mechon wreckage site as a skinny young man sifted through the piles of machine scrap. “A Mechon M71!” He exclaimed. “I bet I can use its optical system to align one of the Anti-Air Batteries.” He let out a disappointed groan. “No good. It’s broken.” He examined it more closely. “The joint section… It’s buckled.” With a grunt, he tossed it aside, almost hitting the hilt of the weapon slung over his back. “It’s completely… useless!” And he flopped back on to the grass, staring up at the sky, past the leaves obstructing his view. A dragonfly flitted above him. He turned his head to watch it land on the stalk of a flower. Hang on… He raised his head, having spotted another, almost perfectly intact, piece of Mechon armour. “An M69!” Excited, he scrambled to his feet and dashed towards it, blonde hair waving as he ran. He slowed as he approached it, placing his hands atop it to feel for any unseen damage. “Its armour would be perfect for making a shield.” He gripped it and attempted to move it. “If I can just get it off, I should be able to…” The metal shook and he staggered backwards, fear creeping into his blue eyes. It’s alive!? “Shulk!” A youth with vivid auburn hair appeared out of nowhere, ramming into the Mechon which then flew through the air and bounced off another piece of metal. He watched warily as it righted itself. 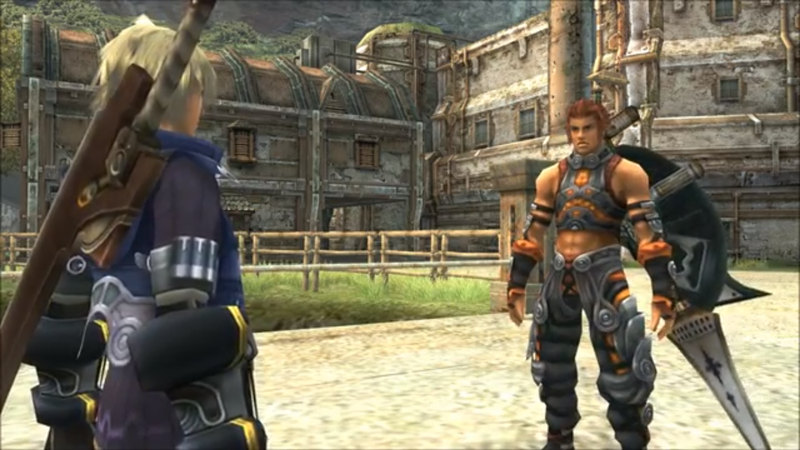 Shulk jumped back as Reyn drew the creature’s attention. He snuck behind it, using Turn Strike to do some extra damage. The Krabble turned on him, ready to attack. It’s only a Krabble, he reminded himself. I’ve defeated plenty of these before, even without Reyn’s help. 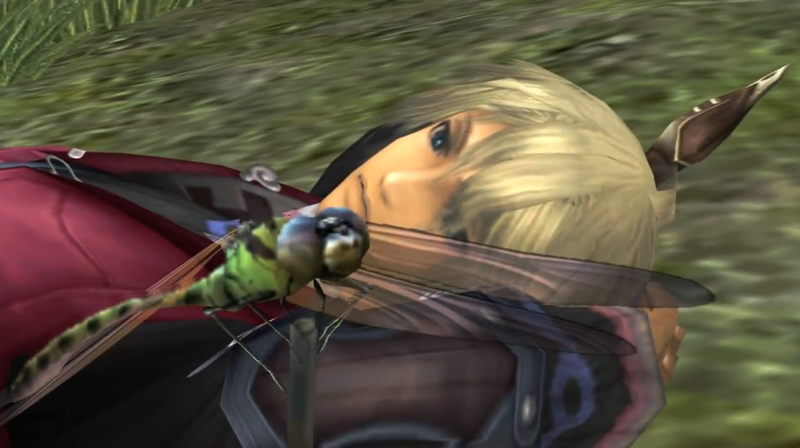 Shulk watched as his best friend swiped at the creature’s feet, causing it to fall on its side and lose its shell. They quickly finished it off. “Ha,” Reyn laughed, “not even a challenge.” They had no time to talk, as a Caterpile emerged from the ground where the Krabble had been. They looked at each other, rolling their eyes, and quickly dispatched the oversized bug. “Thanks Reyn. That was a close one.” Shulk looked up at his friend, glad to see him. “You will, Shulk.” Reyn was sure of it. “Anyway, we’d better get back to the colony. 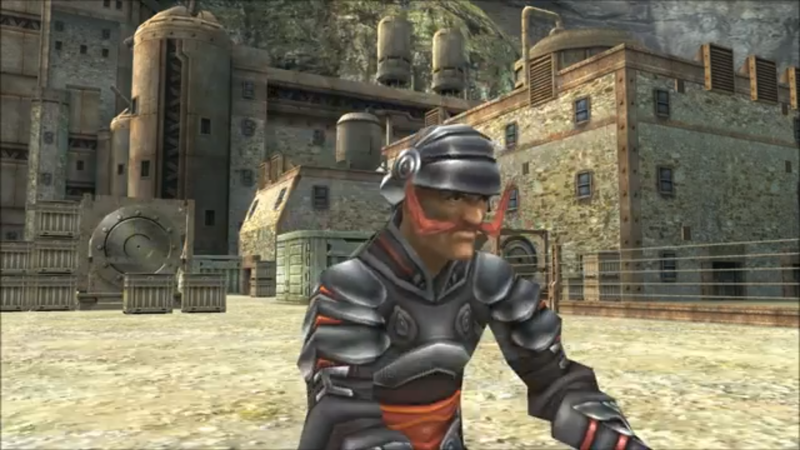 If I’m late for drills again, old Square-tache is gonna kill me.” Reyn repressed a shudder when he remembered what had happened the last time he was late. “Don’t worry about it. 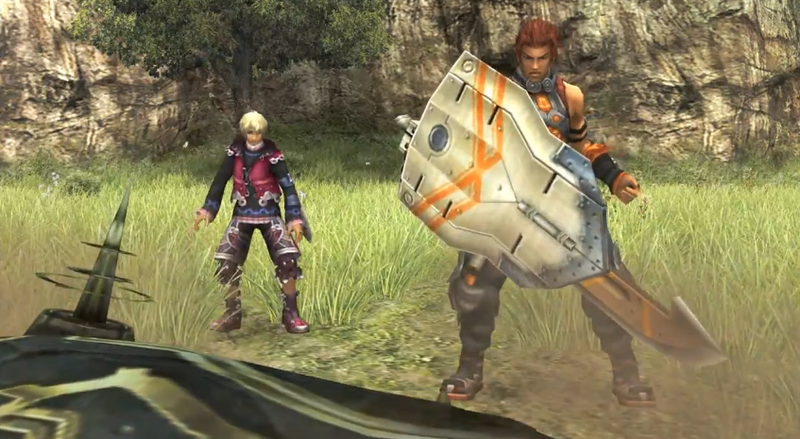 Let’s get back.” Reyn led the way out of the clearing. They made their way back home, passing lively bunnits, buzzing skeeters and lazy caterpiles as they jogged back through the gorge. “All right.” Reyn dipped his head. “See you later.” He left for the Military District, hoping his break wasn’t over just yet. Shulk followed at a slower pace, glancing at Fiora’s house as he passed. I wonder how Dunban’s doing. He continued into the Commercial District; he could see Reyn disappearing around a corner up ahead. Shulk stopped by a man near the entrance to the district. After a quick conversation, Shulk was able to get some coin in return for his spare parts. He looked up at the Ether Light as he passed; at night, its brilliance would light up the entire district. He put his hands in his pockets and kept walking, humming to himself. He began to speak. “Hello there, young’un. I got somethin’ that might interest ya. Rather, somethin’ to tell ya. It’s about this here furnace.” He gestured at the structure beside him. 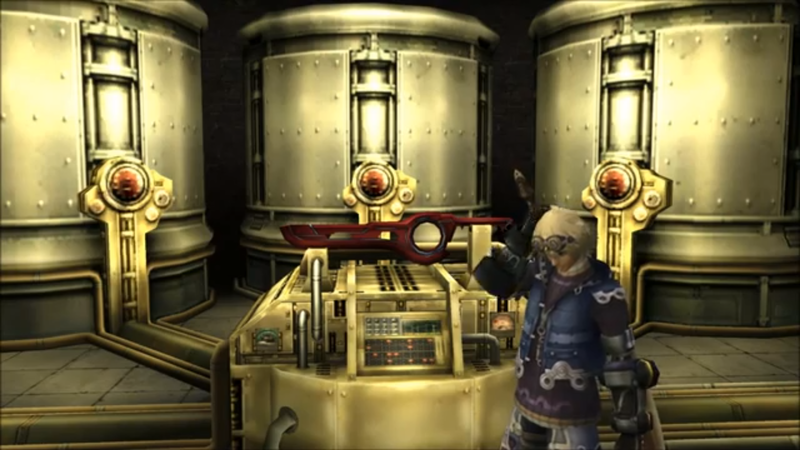 “All right…” Shulk wondered what it was; the furnace looked rather unremarkable. “Okay.” He wanted to learn more about the ether particles in the body, but refrained from asking. I’ll try, Shulk thought, trying not to smile. Shulk tried to speak, but again the Gem Man talked over the top of him. “Never mind… It’d probably be quicker for you to try it. If ya wanna give it a try, just put gems in your weapon slots. That weapon of yours’ll do fine.” Shulk glanced at the sword on his back as the Gem Man held out his hand. In it were two gems. “Thank you!” Shulk inspected the gems in his hand. They were very shiny. How can I not look bothered? Shulk wondered. 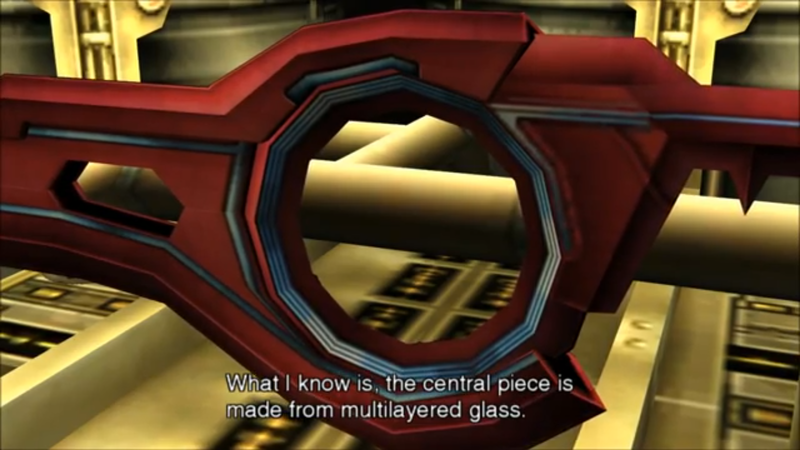 Shulk left the Gem Man, putting his hands back into his pockets as he made his way to the lab in the Military District. He took out one of the gems; it was a beautiful deep blue, the same colour as the water surrounding the colony. He gazed into it, trying to see past his reflection. Shulk jumped and turned to see what the cause of the commotion was. Uh-oh! The colonel’s gonna explode. “But it’s impossible to get back to the Military District in only 40 seconds.” The other soldier finished. “Yes, sir.” The soldiers straightened up. “I told you to keep a stock of fuel in reserve!” The colonel was becoming more and more infuriated. “You’re nothing but slackers!” He raised his fist and Shulk looked away so he wouldn’t have to see the man get hit. 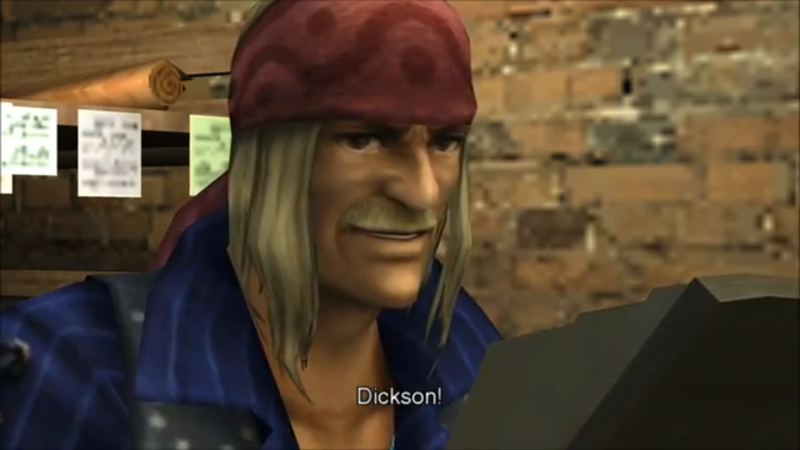 “Same old colonel,” Shulk muttered to himself. “At this rate, the men will all be dead before they see any action.” He discreetly left the colonel and his men and headed into the Weapon Development Lab. He slowly approached the red blade mounted on a machine in the centre of the room. Dickson bent down to examine the weapon, his sharp eyes scanning it with care. “So, you can activate it now then?” He cast Shulk a sideways glance. “So it’s possible that other symbols could appear on different layers?” Dickson guessed. 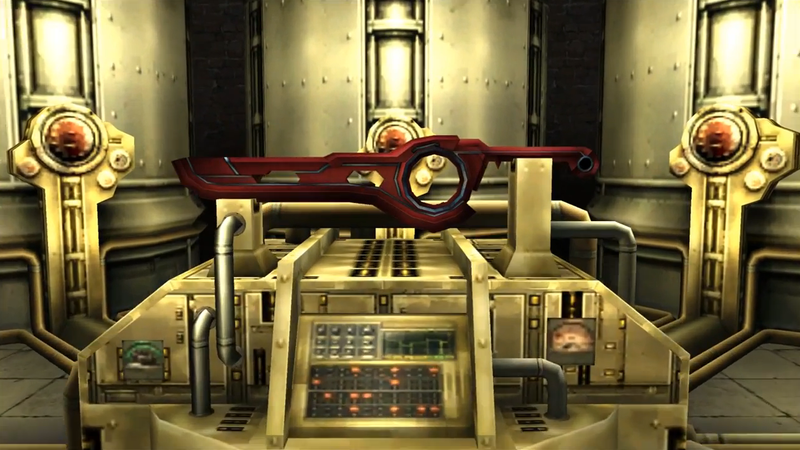 “The Monado might conceal even more power. Am I right?” Shulk nodded. “Dunban! 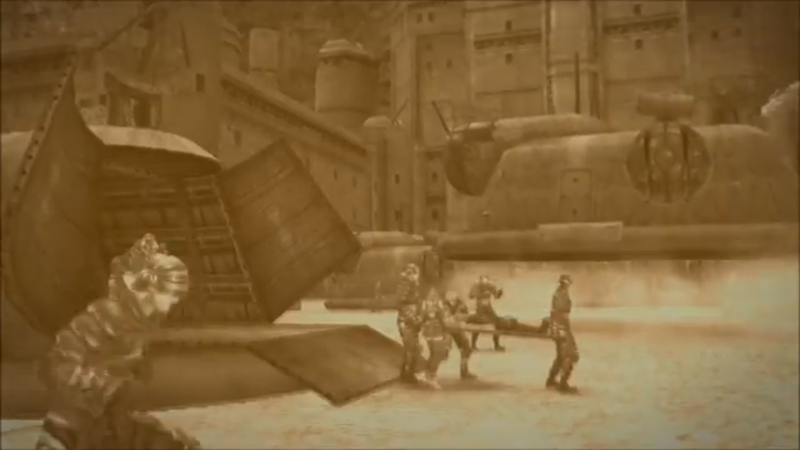 Dunban!” Shulk and Fiora were hunched over his battered body, lying on a stretcher carried by two soldiers. “Dunban!” Shulk tried to get through to his friend. “Don’t look at me like that,” he mumbled, “I haven’t gone yet.” He turned his head. “Shulk…” When Shulk bent down, Dunban began to whisper in his ear. Shulk’s eyes widened, and he backed away from Dunban in shock, watching as he and his sister continued on their way. He looked behind him into the airship Dunban had returned in, at the sword leaning on the wall in the corner, his mind lingering on the man’s words. Dickson sighed, and then faced the young man. “Shulk. You’re spending too much time in the lab. Either that or rummaging for junk in the scrap yard. It ain’t healthy for a kid your age. That’s why you’re always looking so pasty. You should get out, get some fresh air once in a while.” Dickson turned to leave again. “All right, I’m off.” He laughed to himself as he left.